Gregory Day, award winning Australian poet and author, has returned to a theme that underpinned his 2005 musical CD The Flash Road: Scenes from the Building of the Great Ocean Road. The Great Ocean Road is the scenic tourist trail that runs along the Southern Victorian coast between Torquay and Allansford. Originally built by returned servicemen from the First World War, the road is now considered one of the great scenic drives of the world. But this is not really the story of the road or its construction, it the story of one man, FB Herschell, and his relationship with the shifting sand dunes that made construction of the road a challenge for engineers. 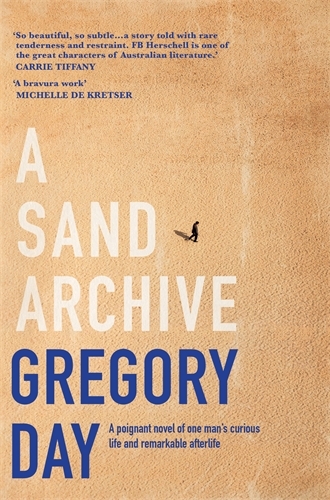 Narrated by an anonymous bookshop employee, A Sand Archive relates the story of Herschell, jumping off from a small self-published volume of his unexcitingly entitled The Great Ocean Road: Dune Stabilisation and Other Engineering Difficulties. This book, written late in Herschell’s life, is one in which the narrator believes “all of the most important things have been left unsaid”. A Sand Archive reveals all of those important things by charting the important, personal aspects of Herschell’s life. This includes his fascination with early Mondrian paintings of Dutch dunes and his interest in the writings of authors like Proust and Camus. But also exploring in detail the turning point of Herschell’s life – a trip to France in 1968. The narrative pivots around Herschell’s visit to France in 1968 to study the dune stabilisation works that have created the largest dune in the world – Dune de Pyla near Bordeaux. Herschell finds himself falling in love and having a brief, intense, life changing relationship with a local student, Mathilde. 1968 was a time of revolution in France and while Herschell gets caught up in the frenzy his focus is still on the dunes. It is Mathilde who is drawn into the broader struggle. Sand is that is the most consumed resource in the world after freshwater and air. Sand that makes a grain out of a mountain and a mountain out of grains. Sand that has no passport, and no conventions or manners, except to change, to change again, to keep moving always and to always change. Sand that has no beginning and no end. In A Sand Archive Day manages to effortlessly combine musings on engineering, literature, art, the environment in a deeply personal story.